Actually i was thinking about converting the project into a Society Car parking system. So a door opening and closing would look better than just an led. The motor is the one used in toys and stuff. Can't be more than 5v.
" The motor is the one used in toys and stuff. Can't be more than 5v." to 5 volts and ground. No 12 volts anywhere. Your driver board is limited to 600 milliamps (just over half an amp). A toy motor could exceed that, but should be okay. Use as small a motor as possible. bigger motors, but will be more complicated. I don't have a new board. And there is Vcc and + and - pins. On supplying 5v to all three pins and Gnd to Gnd, the programming board's led lights up but not the display. I suppose i may have damaged it when i first gave 12v to Vcc before. I guess now i will either have to buy a new l293d board or just use leds as you mentioned. Okay, i have got my hands on a 12V relay driver IC. I have no idea on how to connect it with the motor. 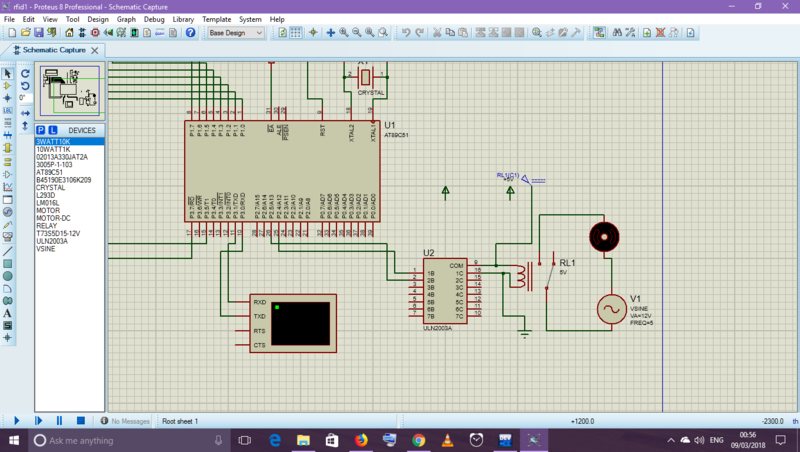 What are the connections and what changes do i have to make to the program code? I have connected the pins in proteus and used the same code that i have posted before to run this simulation. On running the simulation, the motor just starts and keeps on running. What do i have to do to make it run only when i scan a valid rfid tag? Your simulation uses a relay. Do you have a relay...if so what model is it ? If you don't have the right relay your motor can only go one way. Is that okay .. stop and start, but only in one direction ? Meanwhile, remove the connection from U2 pin 16 to ground. It's a single chanel relay. 😔 I guess it won't work. Isn't there a way where i make it rotate in both directions, by giving different commands? Please help me with the codes. I have managed to sort out the connections, tell me if it's right. + and - to 5v and Gnd. NO to the motor and the other end of the motor should be connected to negative of the battery. COM would be connected to the positive of the battery. by giving different commands? Please help me with the codes." There is, but you need the right hardware. There are many combinations of relays, drivers and simple transistors. It depends on what you have or can get. or more single pole relays as in the Proteus simulation ? operated by a coil like a relay. Actually you said you were "thinking" of changing to a secure car access system. No, you will need two limit switches. >now i am stick with led. You could have two LEDs, one for motor forward, one for back. You unlock the car with an RFID key. How do you lock it ?